Welcome to the Official Contra Vision® Blog. Read inspirational case studies and find out the latest news. Can’t See Your Perforated Window Film At Night? Ensuring that graphics are visible is the first priority for any promotional campaign. However, during the hours of darkness, conventional (white on black) perforated window film can suffer from image fading and can become completely transparent with strong lighting inside a building making this basic requirement a real challenge. Performance Translucent White perforated window film utilizes the ambient building lighting and offers great results, both day and night. Author Contra VisionPosted on January 21, 2019 March 25, 2019 Categories Hints & Tips, ProductsTags BBC Media City, Contra Vision, The Creative Place, The Voice, Translucent WhiteLeave a comment on Can’t See Your Perforated Window Film At Night? Sport Relief raises money to help people live happier, healthier, safer lives. It’s a great cause and one that is well known in households across the UK. Working with corporate partners, of which one is the BBC, Sport Relief promotes a range of fundraising activities and events, fronted by television and sporting celebrities, and culminating in an exciting televised night of entertainment on BBC One. 100 years after it began, those who fought in one of the bloodiest battles of World War One have been remembered today. As a tribute we wanted to re-post an application where Contra Vision provided a canvas for a WW1 commemoration on an epic scale…..
Contra Vision was delighted to play a part in HONOUR, a stunning outdoor event inspired by WW1 poets and the memories of men and women from the North West affected by the conflict of 1914 to 1918 which featured hundreds of choral singers and a large scale digital projection on The Quays, Greater Manchester’s waterfront on Saturday 2nd August 2014. The centrepiece was an emotionally-charged performance by a ‘Super Choir’ of hundreds of amateur singers, who performed a specially written piece by acclaimed composer Andy Smith and conducted by renowned Choral Director, Jeff Borradaile. Choirs from across the region and individual volunteers assembled to perform the largest outdoor event of its kind this year. 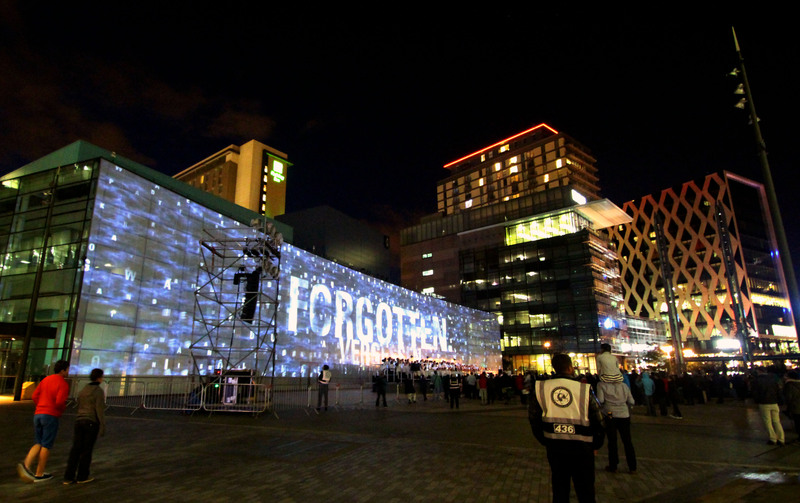 The contribution played by Contra Vision was that the design agency, The Creative Place, used Contra Vision® BACKLITE™ perforated window film to transform the MediaCity buildings into a giant projection screen, with images visible from both inside and outside the building. The images led audiences through the experience of war, from young men signing up to serve in battle, to the feeling of claustrophobic damp in the trenches, the fears of the families left behind and the fear of going over the top. A blaze of fireworks transported audiences from the tranquillity of peacetime to the battlefields of the Western Front to remember the millions of military and civilian lives lost. 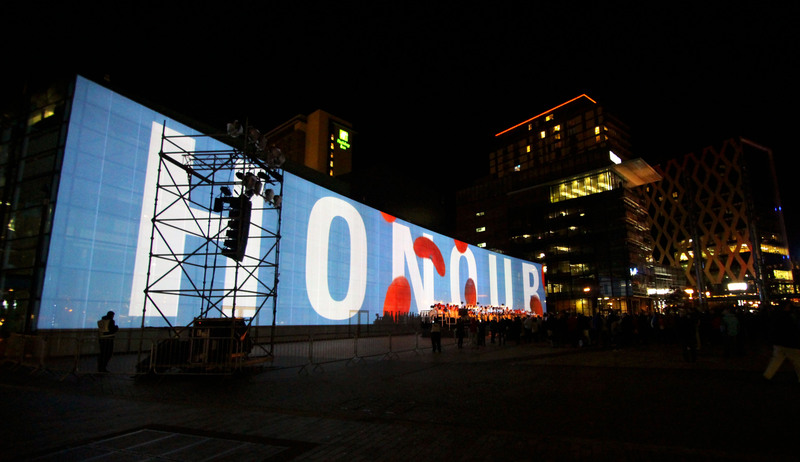 Artists including Creative Director, Craig Morrison, German duo Hartung Trenz and Wales-based animator Sean Vicary were invited to use projected text and carefully curated imagery to tell the story in a way which engaged people of all ages and provided a communal reflection on the 100th anniversary of the outbreak of World War One . Enter your email address to follow Contra Vision Outlook and receive notifications of new posts.